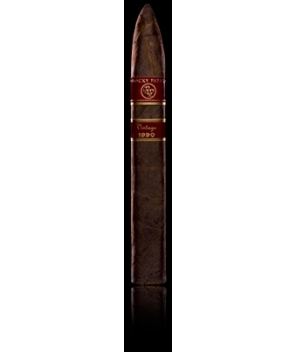 The Rocky Patel Vintage 1992 featured unrivaled accolades of a 92 rating and twice being named to the Top 25 Cigars of the Year in Cigar Aficionado. Don't let the dark wrapper fool you, the Vintage 1992 is a mild- to medium-body cigar with a nutty, caramel essence. This line is highlighted by a 10-year-old Honduran broadleaf wrapper that has softened in strength over the years yet gained in complexity and flavor. Renowned for its elegance and balance, the Vintage 1990 features the unrivaled accolades of a 92 rating and twice being named to the Top 25 Cigars of the Year in Cigar Aficionado.